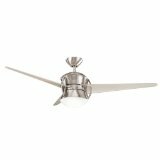 A ceiling fan with metallic or metal blades is sometimes sought after by those going for a more modern look. It may be that you are trying to match up a selected decor in your home. 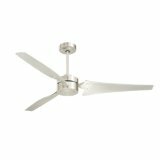 For instance, if you are trying to match a ceiling fan to metal cabinets in your kitchen. Or, maybe you are installing a ceiling fan in your garage and you have steel cabinets in there. 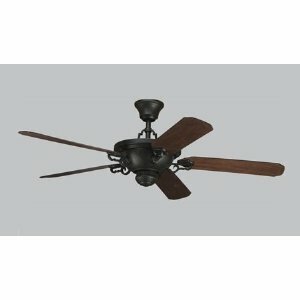 In any case, a ceiling fan with metal blades is more of a custom approach to a ceiling fan installation. 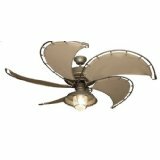 It can be difficult to find the ceiling fan you are after, or knowing how to pick the right one. 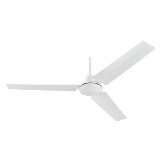 One thing to consider is whether you want a metallic blade fan with a light kit or not. Most come with remotes but not all come with light kits. Click on each one to found out whether it comes with a light kit or not. Metal blades are heavier then their wooden counterparts, so the motor required to turn the fan may need to be more powerful then other fans. Another good idea is to purchase your metal blade fan with replacement blades. Finding replacement blades later (it could be years later) often becomes a chore. Many fan owners unfourtunately wind up throwing out their fan 5 years down the road when a blade snaps, bends or breaks, instead of replacing it. This is because they don't have a lot of time to go around looking for replacement blades (and it can take time and many phone calls at that point). 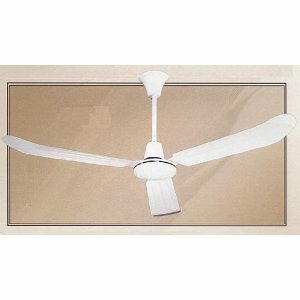 We have a number of ceiling fans listed which are brushed steel, others also feature iron bladed designs as well. There are different fans listed with a variety of different heavier blades. These heavier blades can of course cause more damage if something gets stuck in the way of the fan. This is of course not an optimal operating condition for any fan, but be careful that your metallic fan does not have anything in it's path. Some also believe that metal fans require more maintenance. This is not necessarily the case actually. You can take a look at the industrial commercial fan for example. It is a metal fan for around $50, which is an excellent value. It's a simple white enamel finish and the blades are heavier. But the fan description states that the fan requires virtually no maintenance whatsoever. 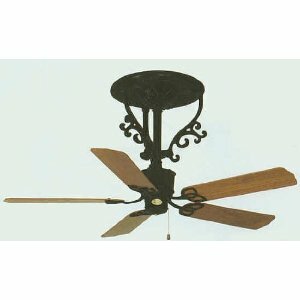 A metal fan generally oes not need any more maintenance than a wooden fan or any other fan would require.